Monica Schnitger delves into the appification of CFD with a look at Altair’s CFDCalc. CFD Support introduced Water Turbine CFD, an OpenFOAM-based methodology for analysis and design of water turbines. ASCON released C3D V15, the latest update of its geometric kernel. Optimal Solutions released Sculptor 3.5 for mesh morphing. VRMesh announced the VRMesh Triangulation for AutoCAD plugin. DEVELOP3D writes about Materialise Magics 18 because it’s “utter nonsense” that 3D printing is as simple as loading your data and pressing print. 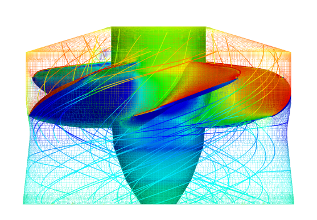 A CFD solution from Water Turbine CFD. Image from CFD Support. Here’s the best of the visualization web for December 2013. ANSYS announced the first commercial GPU-accelerated fluid dynamics solver. Developed in partnership with NVIDIA, the product reportedly halves the time to run ANSYS Mechanical and saves engineers days of time according to early adopters. But ANSYS’ use of the term “first” in the announcement’s title made me scratch my head because I was certain others in the CFD world were using GPUs. So I emailed the ANSYS point of contact and received a prompt reply. [Thank you, Jackie.] The point they’re making is that their implementation is the first of the actual CFD solver algorithm in a commercially available product. Symscape thinks that’s cutting a fine line. Their Caedium CFD is based on OpenFOAM, an open source solver, but GPU acceleration in their commercial implementation has been available for some time now. Are we walking the fine linguistic line between closed and open source software? ANSYS’ news also came as surprise to CPFD Software whose Barracuda product has had GPU acceleration – in the solver part of the code – since last year. But they realize that their product is perhaps a bit too specialized to have as broad of an appeal as ANSYS’. But still, first is first. What do I think? I think GPUs are a great compute resource that we should all consider as a means of improving software performance for our customers. I’m betting that ANSYS’ implementation will provide great benefits to their users. At Pointwise we did an in-house project a couple of years ago (results presented at the SIAM Conference on Geometric and Physical Modeling in 2011) that showed speed-ups of over 35 for some operations. However, we concluded that the GPU-specific coding would pose long-term maintenance challenges due to its complexity so we shelved the project. However, it’s probably something that we should reconsider given the improvements in the technology over the past couple of years. Also, when we polled our customers very few of them reported using the appropriate double-precision graphics cards that we’d need. I wonder if that situation has changed? So yes, I’m doing a lot of wordsmithing here regarding the word “first” at the expense of our friends at ANSYS. [Don’t be too annoyed, ANSYS. I also poked holes in CD-adapco’s beehive analogy for polyhedral meshing.] But I am now interested in knowing who’s writing CFD codes of any kind that use GPU for any part of the process. Let me know in the comments. U.S. speedskaters at the Olympics are wearing an Under Armour speedskating suit that was designed with the help of CFD and which is said to be the fastest in the world. The only problem is that skaters are complaining that the suit’s design (specifically the vents on the back) are slowing them down. IMAGINiT provides a case study of using CFD to improve the efficiency of an air-cooled condenser. From the CFD Letters journal comes Numerical Study of Mixed Convective Cooling in a Ventilated Cavity Utilizing a Guide Baffle. SpeedDream is using CFD to design the hull and keel of their monohull. CFD is being used to determine where best to site wind turbines in a built environment. Bureau Veritas has entered into an agreement with HydrOcean by which the latter will provide CFD services to the former’s clients and by which the former will market the latter’s services worldwide. The two organizations work primarily in the marine field. 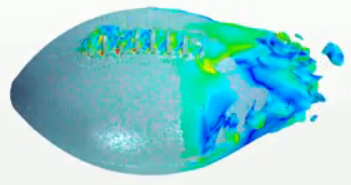 Screen capture from a video of football aerodynamics computed using STAR-CCM+. Image from ENGINEERING.com. Desktop Engineering summarizes the recent Global Product Data Interoperability Summit. The JT format (an ISO standard) is praised and a new format (FGCM) is proposed. There’s a lot more at the link. ESI announced that the 2nd OpenFOAM User Conference will be held on 7-9 October 2014 in Berlin. Brooklyn-based artist Lori Ellison has her second solo exhibition at New York’s McKenzie Fine Art through 16 February and many of her paintings and drawings seem perfect for the mesh generator in all of us. You can tell from “wacky absurdity” that, even though she works in a different medium, she knows all about mesh generation. Update [14 Feb 2014]: I emailed Valerie McKenzie, gallery owner, for background on Lori’s interest in mesh-like forms. Here’s her reply. 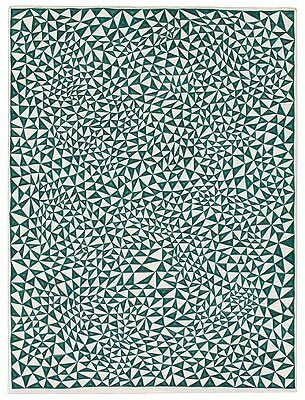 “Not only is the triangle one of the simplest two dimensional forms, it is also remarkably versatile in the creation of pattern-based abstraction that Lori favors. Meandering triangles can swirl and coil into vortices, reticulated fields sway and have movement while referencing nets and webs of all sorts (actual, virtual, metaphysical, spiritual), and triangles set in rows have an interesting Op-like effect of creating a visual confusion between the figure and ground. “Lori’s work references the natural world, architecture, textiles, the works of other artists. She isn’t thinking of scientific imaging or mathematics. Bonus: Caddell & Williams is a San Francisco based purveyor of “superb distilled spirits.” In particular, they stock barrel-aged cocktails from Germain-Robin including their series named Fluid Dynamics. The 3-bottle sampler is only $57 so I’m hoping one of you readers will try it and report whether it improves your CFD. If not actually, maybe just your perception of whether it’s better. This entry was posted in Applications, Events, Hardware, News, Software and tagged Altair, AutoCAD, Barracuda, CD-adapco, CFD Support, ESI, GPU, IMAGINiT, Materialise, OpenFOAM, Optimal Solutions Software, Sculptor, STAR-CCM+, Symscape, visualization, VRMesh. Bookmark the permalink. Interesting, I just saw the football link, which is something I referenced at the CAE linkedin forum. So to be fair, I read the article. Here is my post to that article. “From my understanding, reliably analyzing the dimples of a golf ball requires DNS. Turbulence models (including LES) do poorly. Also, the onset of turbulence is somewhat discrete with dimple depth. It does not take much. The football is also more boattailish than the golf ball, so it will take less turbulence to keep the flow attached. I’m skeptical that CFD actually does that well in predicting drag and spin resistance of a football. Hopefully, someday a university will run the test and the general public will be a better idea of what is going on. BTW, from what I understand, it took a few billion cells to analyze a golf ball. Or something like that. I heard it by word of mouth. I’d have to hunt it down, but I don’t have time. Bummer. In other words it is there but right now its not actually useful for anything that is worth buying a GPU over. The main issue at the moment appears to be the lack of memory on the GPU processors which means that the memory needed for the halo cells used to communicate over mesh partitions becomes too expensive. I am sure things will improve but we are not there yet. Chris, thanks for the additional information about GPU-acceleration in ANSYS’ CFD products. ANSYS Mechanical was cited because that’s what was quoted by their customer. It’s interesting that you say “worth buying a GPU over.” Considering that engineers likely have a decent graphics card anyway to support various CAE tools, it seems to me that GPU acceleration would be a nice bonus to take advantage of hardware you already have. That is sort of what we were thinking, but unfortunately you cant just use any old GPU either. I wasn’t the one looking at costings but from what I can understand you could quite easily get another decent workstation for the cost of the right kind of GPU. You’re right that not all GPUs are equivalently useful. The conclusion of our research showed that an NVIDIA Quadro 600 gave a performance boost on par with a 1-4 core CPU while the bigger Quadro 6000 was on par with 8 cores. However, our application needs double precision floating point support which does raise the price bar. Plus, it’s not like the entire application starts running faster just because you have a GPU – each function in the code has to be coded for GPU support. Thanks for the update on this work, Jonathan. Tim Warburton has done lots of good work on higher-order CFD on GPUs, and demonstrates really nice performance improvements (using Nek, a spectral element LES code), but doesn’t appear to have published anything in the open on it recently. Another observation/topic: the Ellison art piece made me wonder what is the clean mathematical/topological statement that guarantees a figure like that will look “interesting” (i.e. lots of alternating colors between neighboring colors). The answer was pretty simple once I thought about it (even vertex-edge valence). Tim, I’ll try to find a work that doesn’t lend itself so easily to mathematics.